Pull Out Your Number Twos, It’s National Pencil Day! For pencil lovers across the world, March 30th of every year is a day to celebrate! Established in 1858, National Pencil Day was created in honor of the modern day pencil’s first patent. It was on this date that Hymen Lipman was issued a patent for the first pencil with an eraser. Interestingly, Mr. Lipman’s patent was later challenged, and ultimately revoked by the U.S. Supreme Court, who ruled the pencil was not an invention but rather a combination of two preexisting things with no new use: pencils and erasers. Never-the-less, the holiday endured. And pencils are now used for everything from taking standardized tests to jewelry and artwork! More than 14 billion pencils are produced in the world every year- enough to circle the globe 62 times. Pencils don’t really contain lead. That gray matter is graphite and clay. Two billion pencils are made in the United States each year. The pencil was invented more than 400 years ago, in 1565. Famous novelists Ernest Hemingway and John Steinbeck used pencils to write their books. Pencils didn’t always have erasers on them because teachers felt they would encourage children to make mistakes. It would cost $50 in labor and materials for a person to make a 10-cent pencil. One million pencils are used annually on the floor of the New York Stock Exchange. 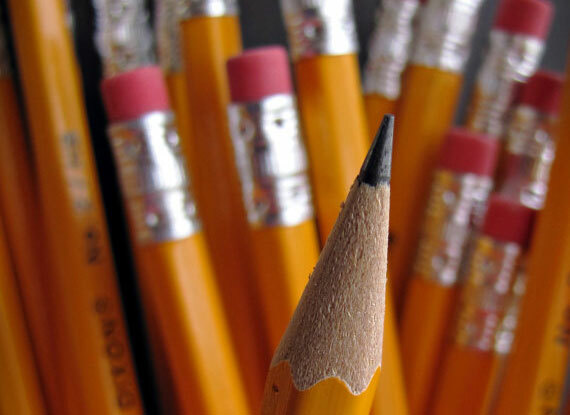 The average pencil can be sharpened 17 times,write 45,000 words or draw a line 35 miles long. A good-size tree will make about 300,000 pencils. Francis Scott Key wrote “The Star Spangled Banner” in pencil. The #2 pencil is the most common. There is a #1, #2.5, #3 and #4. The numbers are based on hardness and darkness. That’s why most tests are taken with #2 pencils. John Steinbeck was an obsessive pencil user and is said to have used as many as 60 pencils a day. His novel East of Eden took more than 300 pencils to write. Henry David Thoreau penciled Walden Pond. After all, his father was a pencil manufacturer. Thomas Edison had his pencils specially made by Eagle Pencil. Each pencil was three inches long, was thicker than standard pencils and had softer graphite than was normally available. Vladimir Nabokov rewrote everything he had ever published, usually several times, by pencil. Johnny Carson regularly played with pencils at his Tonight Show desk. These pencils were specially made with erasers at both ends in order to avoid on set accidents. Roald Dahl only used pencils with yellow casing to write his books. He had 6 sharpened pencils ready at the beginning of each day and only when all 6 pencils became unusable did he resharpen them.